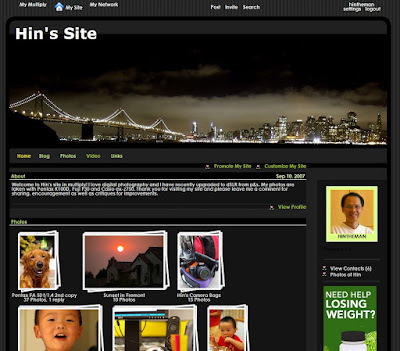 I have just created a multiply.com account for trying out merging my photos and blogs together in one place. This is a very kool site for one to display photographs and I think the site is based in java and after a day of simple cutomization with CSS, I managed to create a simple site with little efforts in editing and multiply.com provides a very simple and user friendly user interface in importing photos with Flickr as well as RSS setup for blogging. My initial impressions are all wonderful and I am yet to invite friends over to form useful community for Pentax, Fuji and Casio. If you happen to be have an account in multiply, please send me an invite. The above badge will lead you to my multiply site. One question I have is in regards to cross-post between Multiply and Blogger account. Seems like it works when I post the blog on Multiply, it will cross-post to Blogger, but not the other way around, do you have this issue?